01. The walk is open to everybody and available for all-aged people. Those walkers younger than 16 years must be accompanied with a grown-up. The participation of the walker in the walk goes under his/her responsibility. 02. To participate in any of those routes, walkers must have been registered properly according to the established rules. Registration can only be individual. 03.- To participate in the Barnatresc routes of 10 km (marked with green plastic bands and arrows), there's no need of previous registration and no fees to be paid. Walkers only have to go to the start point and do what the Barnatresc rules say. All the walkers must show the Barnatresc card to the bar-code readers at the start, the pas controls, and at the end of the walk. - Walkers must go to the place and time established for the 20 km routes. - To validate the participation, they must have let their bar codes read by the readers at the beginning and end of the walk. If they do not pass one of them, it will not count. 05. Those members of the IML older than 70 or younger than 10 can walk the 10 km (Barnatresc International) routes to get the participation control for their IML passport, according to the IML rules. They have to register themselves as if they had to walk 20 or 30 km and pay the established fee. The 10 km (Barnatresc International) routes begin from 9 am till 9.30am every day, and the event will end at 1pm. 06.The fee of the registration is of 15€ if you registrate yourself via internet, and 20€ if the registration is made in person. This fee will not be given back under any concept. The registration fees must be paid when registering. 07. Those participants registrated by internet must collect the control form, together with the rest of papers (maps and guide) on October 4th, 5th, and 6th in the Auditori of the Centre Civic Cotxeres de Sants, 79 Sants street, Barcelona (Metro L1 and L5 Plaça de Sants). Those participants registrated in person will collect the papers when they registrate. It’s compulsory to collect the Control form, because it must be shown at the start and end of the walk. In those moments, your bar code will be read. It will also be used to prove your pass by the different controls of the routes. Those marks will prove to have walked 20, 30 or 40 km routes, what will give the access to diploma and/or medal and the registration of the activity if the walker is member of the IML and/or IVV. 08. When walkers have completed three participations, all in a row or alternatively, s/he will get the title of Master CIB. S/he will receive a diploma with his/her name, signed and stamped by the organization of the CIB in the closing ceremony of every year. 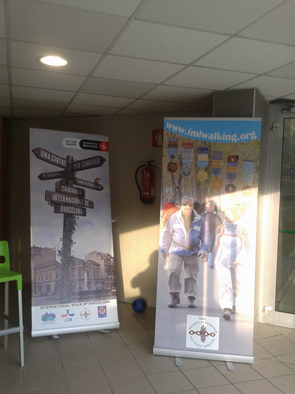 A participation means to have walked, minimum, one route of 20, 30, or 40 km any of the 2 days of the CIB. To collect the diploma it’s compulsory to show the registration and the Route form with all the marks of the three walks made. There will be an open register of titles of Master CIB in our website. 09. Medals and souvenirs.- The first time a walker participates in the CIB s/he will get a medal and an annual distinctive (bar) if they have walked both days in any of the routes (20, 30, or 40 km), without distinction. 10. To have the medals and souvenirs and to be inscribed in the register of participation, according the established procedure, walkers must show at the end of the route the Route Form with all the proofs that s/he has been in all the established controls. 12. Marks are arrows and plastic bands: blue for 20 km routes, red for 30 km routes, and yellow for the 40 km route. There will be, also, supporting signposts. 20 km route: from 7 to 8 am. 30 km route: from 7 to 8 am. 20 km route: from 7.30 amb till 8.30 am. 14. The start and end of all routes will be the Auditori of the Centre Civic Cotxeres de Sants, 79 Sants street, Barcelona (Metro L1 and L5 Plaça de Sants), excepte the 30 and 40 km routes of October 6th, that will start (by bus) in Pg. Sant Antoni/Alcolea (Metro L1 and L5 Plaça de Sants). All days, the end of the event will be at 5.30pm. 15. All controls have an established timetable to open and close. Those walkers who arrive before or after them will not be participants of the walk any more. 16. To participate in the 30 and 40 km routes of October 6th, it is compulsory to register previously and use the bus prepared by the organization in order to link the neutralized sections. Because of this, there's an extra fee of 8€ that must be paid with the register fee. Once inside the bus the Route Form will be marked as the beginning control. Those walkers who do not have this stamp will not participate. The registration for this route will end at 8am on October 20th. The organization cannot guarantee a seat in the bus to those who have not registered themselves by this time. 17. There will be provisioning controls in all the routes (drink or food). 18. As for some routes there's no inscription or because inscriptions can be made until the start time, the organisation cannot know with a lot of anticipation how many participants there will be. For this reason, the distribution of drinks and food in the controls will be made according to the availability of the previsions made. Walkers must carry the water and food they could need for the walk, because the food and drinks given during the walk are just for maintenance. 19. A health care service will be prepared at the beginning-end of the routes and all along each route. 20. All the routes combine urban sections and rural sections of different lengths. Some routes have a considerable accumulated slope (up or down), so walkers must check the slope profile that can be found in the routes map. 21. In urban and non-urban sections, walkers must always respect all the vehicles rules established for pedestrians (zebra crossings, traffics lights, signals, etc.). Except in some special places, the normal vehicle circulation will not be closed for pedestrian use. 22. In the non-urban sections, walkers must be extremely concerned to respect the environment. 23. Walkers must respect the rules established by the organization, especially about rubbish treatment and to keep clean all the places by which the walk goes on. 24. Registration includes an accident insurance for walkers of 20 and 30 km routes of the Caminada Internacional de Barcelona, with Zurich insurance agency. The organization declines all responsibilities about any damage or prejudice that this activity could cause to the walker. Walkers are responsible of all damages and prejudices that could be caused to other walkers, to themselves or to third natural persons or legal entities. 25. Walkers are responsible of all damages and prejudices that could be caused to other walkers, to themselves or to third natural persons or legal entities. The organisation of the CIB is not responsible, apart of what the law says, of accidents or illnesses of the walkers, neither the loss of objects or any other prejudice that the participant could claim. 26. Bad weather conditions and rain will not make cancel or postpone the walk. But, if there is any really important cause, even at the very last time, routes or sections of them can be cancelled or modified. In any of those cases, walkers will not have the right to claim the return of the fee of inscription neither to a compensation for any material or non-material damages. 27. The inscription to the walk means that walkers agree with those specified rules, and that s/he agrees that their personal data or images could be used for information or promotion purposes of the Caminada Internacional de Barcelona and the walks of Barnatresc. They will not have the right to claim for a retribution for this. According to the Llei Orgànica 15/1999, of Desember 13th, about Personal Data Protection, we inform you that your personal data will be included in a file that belongs to the Associació d'Entitats Excursionistes del Barcelonès, in order to be able to participate in our events and to keep you informed. When you give us your personal data you are giving us autorization to be used by the Associació Caminada Internacional de Barcelona and by Ajuntament de Barcelona - Institut Barcelona Esports to let them inform you about their activities.